Everyone loves spending time out on the boat at the lake. But nobody loves being stuck on the side of the road with a blown out trailer tire on the way to the lake. Just as you maintain your vehicle and boat, it is important to check and maintain your boat trailer tires. Unless you’re buying a brand new boat and trailer off the dealer lot, you are more than likely going to be in the market for some new boat trailer tires. If you don’t know how old the boat trailer tires are, you can check the DOT code on the side of the tire. The last set of four numbers in the tire DOT code indicates the precise week and year of manufacture. In the example below, this tire was manufactured in the 35th week of 2007. Now that you have an idea of how old your boat trailer tires are, you need to evaluate the condition of the tires. This tire is due to be replaced because all of Lincoln’s head is visible. 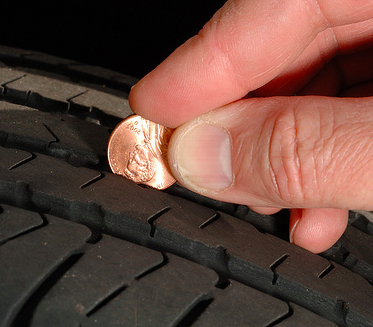 An easy way to check if you need new tires is by the depth of the tread. To do this, you can use the Lincoln penny trick. All you do is set the penny, with the head facing down, into one of the grooves in the tire tread. Best to pick a couple of spots on the tire. If you can see the top of Abe’s head with the coin in position, then it’s time to start looking for some new tires. The other thing to check for is cracks in the tire rubber. Boat trailers usually sit unused for long periods of time. Obviously the tread isn’t wearing out when the trailer is parked, but the rubber does degrade due to expose to UV rays. The rubber basically dries out and cracks start to appear. These usually appear in the bead area of the tire close to the rim but you may also see small cracks between the tread blocks or in the grooves of the tire. Shallow cracks and even some discoloration is usually no cause for concern. Deeper cracks warrant closer inspection by a tire expert. Cracks in the sidewall of the trailer tire should be inspected by a tire expert. Dedicated trailer tires are marked as ST. This will be marked on the tire’s sidewall along with the size of the tire. The tire may also say, “trailer use only.” ST tires have stronger sidewalls that allow them to carry a heavier load that standard Passenger car tires or Light Truck tires. There are two kinds of ST tires; bias-ply and radial. Which kind of tire you buy will depend on what came on the trailer originally, how you use your trailer, and your budget. In short bias-ply trailer tires are cheaper and are recommended for infrequent short haul applications that include off-road or heavy loading. If you plan on long highway driving trips you should consider replacing those bias-ply tires with radial tires. Radial trailer tires are made to run cooler for longer hauls, and to have a longer tread life. Never replace radial tires with bias-ply tires without consulting the trailer manufacturer or a tire professional. Tires-easy has a user friendly search selection box to allow you to find the trailer tires available in your size, while allowing you to choose between bias ply and radial trailer tires . Now that you know what kind of tire to buy, you must take into account the size, and the load capacity of the tire. The load range on trailers are classified as B, C, D, or E. B is the lightest classification of load capacity and E carries the heaviest capacity load. Most boat trailer tires fall under C or D. If boat trailer tires hold a C Load that means it can carry up to 1,820 lbs. On a single axle trailer this means that the boat trailer tires can support up to 3,640 lbs. This includes the weight of the trailer, the boat, the boat’s engine, as well as anything else on the boat. It’s important to remember single axle trailers can carry 100% of the load rating, but double axle trailers must have the load reduced by 12%. 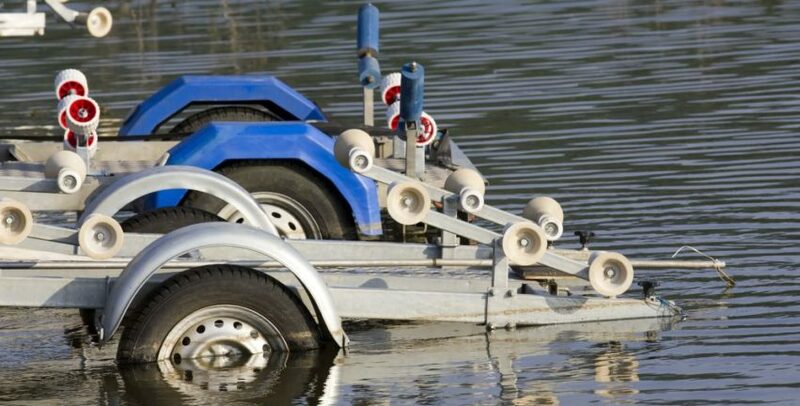 Once you have the perfect set of boat trailer tires it is important to keep a few things in mind. Even though many of us want to reach our destination as fast as we can, boat trailer tires are made to not exceed speeds of 65 mph (100 Km/h). Doing so, for long periods of time could lead to tire failure. If you are going to be traveling on high speed highways, you certainly don’t want the weight maxed out. Avoid loading up the boat with extra weight during transport. Moving any heavy cargo from the boat to the back of vehicle itself actually does allow your trailer tires to withstand slightly higher speeds for longer periods of time. It is also necessary to take proper care of your boat trailer tires in the winter season and other periods of nonuse by protecting them from UV light. There are special wheel covers, however a standard tarp or coverage in garage is equally effective. The final thing to remember is that you should rotate and balance your boat trailer tires just as you do on your car or truck. Even rotating your tires side to side on a single axel trailer will help even out irregular treadwear and extend the life of the tire. On a double axle, the standard X rotation is in order from time to time, particularly if you notice that irregular wear patterns are developing in the tread. With this information, you can now feel confident in maintaining your boat trailer tires, and in making a well informed purchase!